CSX Corporation (NASDAQ:CSX) is one of the largest railroads in the United States. It's a good business since it operates in an oligopoly, but the business environment has been getting tougher, which is why the railroad's shares are down some 35% over the past year. But here are three things that could make the decline even worse. Railroads are a vital cog in the economy, helping to move things from where they're produced to where they're needed at relatively low cost. But they can't control how much stuff their customers ship by rail. For example, CSX's volume was down in all but three business lines last year. And two of the three standouts saw volume growth decelerate year over year. CSX isn't alone. Norfolk Southern (NYSE:NSC) saw volume declines in all but one of its key business lines through the first nine months of 2015. Worse, Norfolk Southern provided a somber outlook for the future at an analyst conference late last year. Basically, business is already slowing down for the railroads. If it gets materially worse -- say the United States falls into a recession -- expect the already dour news to get really bad. Investors will probably react by selling. One of the things CSX can do to make its business more profitable is to run as efficiently as possible. It has to spend lots of money to keep its trains running on time, but the more streamlined the business, the more money that falls to the bottom line. On that score, 2015 was a good year, with the company's operating ratio, a measure of how well the business runs, dropping to 69.7% from 71.5% in 2014. The lower, the better. The company's goal is to get to the mid-60% range. That's a great goal, and CSX has been doing well in its drive to achieve it. But that doesn't mean it will get there. A railroad sounds like an easy business to understand, but it's actually a logistical nightmare to figure out what has to go when and where -- and ensure that you have what's needed to do it. If CSX's efforts to keep getting more efficient stall, investors are likely to take the news poorly. Although it seems like a distant memory today, it was just a couple of years ago that all of the railroads got slammed by the so-called polar vortex. The extreme cold and heavy snow of that period brought the railroads to their knees -- which, in turn, took a toll on their top and bottom lines. Essentially, railroads such as CSX and Norfolk Southern had to spend heavily to get their businesses back up and running and to clear their shipping backlog. Although the current winter has been relatively tame, a stretch of disruptive weather could again snarl the railroads. Since Mr. Market has lived through this once before, I'd expect investors to sell first and ask questions later. CSX and its peers are already facing some headwinds. And there are some additional issues you might want to watch -- just in case. A recession and severe winter weather are two risks that could affect the whole industry, while a failure to meet operating efficiency goals is a third that's more specific to CSX. 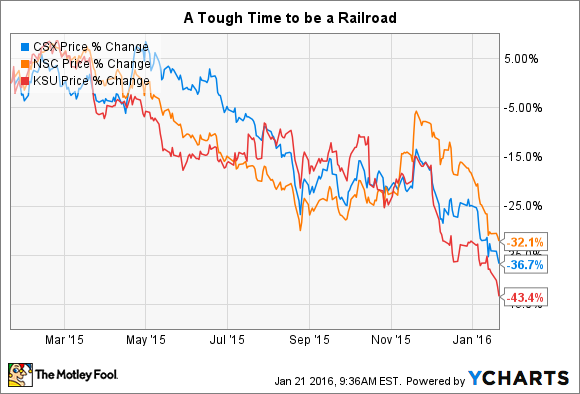 If you own or are thinking about investing in this railroad, these are three reasons CSX's stock could fall in 2016.